It’s March, 2011, and I’m in Sydney, Australia. I wander into a supermarket to pick up a couple of bananas—and immediately suffer from sticker shock. Price of two bananas: $7! Turned out that a few weeks before a combination of floods, followed by Cyclone Yasi, had devastated the northern Queensland farms which produce some 90% of all Australian bananas. 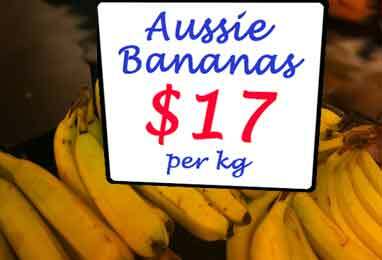 Thanks to the shortage prices soared from around $2.50 a kilogram to $17 per kilo. Prices only fell back to normal around December 2011—ten months after the cyclone hit. A similar shortage occurred in 1989—with a very different result. Washington apples were pulled off the market thanks to a scare that they had been contaminated with Alar, a chemical that helped extend the shelf-life of apples and other fruits, but was feared could cause cancer. At the time I was living in Hong Kong, where Washington apples had a virtual monopoly. Overnight, apples weren’t to be had for love nor money. Imagine my surprise when, just one week later, I walked into the supermarket and, lo and behold, there were apples. At the same price Washington apples had been—even though Chilean apples have to travel twice the distance to reach Hong Kong compared to Washington apples shipped from Seattle. What’s more, the only way those Chilean apples could have arrived in Hong Kong in such a short time was by air freight. Not the cheapest method of transport. Why, you might wonder, didn’t Australia’s banana shortage in 2011 spur a flood of bananas from Central America, the Philippines, or elsewhere? For the simple reason that banana imports into Australia are prohibited, to prevent the importation of diseases that could devastate local production. While Hong Kong was and still is a free port, with no tariffs and almost no restrictions on what can be imported. Thanks to Australia’s banana ban we can see the dramatic contrast you, the customer, experiences between an open market and a closed one. Between free trade and restricted trade. Free trade = low(er) prices and abundance. Protectionism = high(er) prices and shortages. You—the Customer—Always Pays the Price . . . The protectionist price hike is rarely as obvious as happened to the 9-fold increase in the price of Australian bananas. Consider aluminum, something you buy pretty much every time you go to the supermarket. Not necessarily aluminum foil: aluminum is widely used in food packaging: soft drink and beer cans, cheese, chocolate, and candy wrappings, and a multitude of similar products. Trump’s proposed 10% tariff on aluminum imports will enable American aluminum producers to raise their prices by the same amount—and bank the difference. Let’s assume that by the time the price hike reaches the supermarket shelves it adds one cent to the average weekly spend. Hardly worth worrying about, right? Yet—there are around 126 million households in the United States. While you’ll hardly miss that one cent a week coming out of your pocket, all Americans will be spending an extra 126 million cents per week. A total of $1.26 million per week, or $65½ million per year. $65½ million that won’t be spent on other things at the supermarket. You’ll also find steel in the supermarket: think beer and canned food. Trump’s 25% tariff on steel imports will add another cent or two to your weekly grocery bill—or $65½ to $131 million a year. Those pennies sure add up. No doubt American aluminum and steel makers are licking their chops at this prospective flood of pennies falling into their bottom line. But every penny that comes out of your pocket adds up to $131+ million worth of products that you and your fellow citizens won’t be buying from hundreds of other American companies. Though those lost sales—and lost profits and lost jobs—will be all over the map, they’ll be just as real as if a single company lost all its customers overnight. Like MOD Pizza. Which is number 327 on the Inc. 5000 list with 302 locations, almost 3,000 employees—and (coincidentally) $131 million in annual sales. If a company like MOD Pizza shut down as a direct result of Trump’s tariffs, it would be headline news. But the same 3,000-odd jobs lost from the aluminum tariff will be spread all over the place. The only people who’ll notice will be the people who lose their jobs—and their families. So you won’t be aware of the price . . .
Far bigger job losses will come in industries that manufacture products containing lots of steel or aluminum—but don’t sell their products in supermarkets. The average American car contains 2,400 pounds of steel. And 327 pounds of aluminum. Assuming steel and aluminum makers can hike prices by the full extent of the tariff, that will add around $200 to the average production cost of American cars. With wholesaler and dealer markups, $300 to $400 on the dealer’s lot. PLUS sales tax, where applicable. Around a 1% hike on the $33,000 price of the average American car. Doesn’t sound like much—unless you’re one of those millions of Americans to whom $300-$400 is a chunk of money worth worrying about. But if you happen to be working in the business of exporting cars (or trucks, tractors, plows, combines, refrigerators, washing machines, stoves, electric motors, knives, spoons, or forks, to mention just a few of the products containing lots of steel) then you’ve got a problem. If you’re the boss, you’ll have to increase your prices to cover the 25% hike in the cost of steel—a price hike your competitors outside the US won’t be in any hurry to match. If you just work there, the inevitable fall in export sales will mean somebody will get laid off. An intriguing and crystal clear example comes from America’s largest automobile exporter. Bet you can’t name the company. If you figured it’s GM or Ford, you’re dead wrong. GM and Ford do sell millions of cars all over the world. But they’re mostly made outside the US. Especially in China—where GM is the market leader! Believe it or not, the biggest US exporter of cars is BMW. In 2016, BMW’s plant in Spartanburg, South Carolina, produced 411,171 vehicles—and exported 287,700 of them. Or 69.9% of its total production. Imagine you’re the chairman of BMW. President Trump has suddenly increased your production cost in the US by $200 (or more on bigger vehicles). If you try and pass that on to your customers outside the US, some of them will decide to buy a Lexus or a Mercedes instead. supply those markets from your other factories—so your autos will remain competitively priced? BMW in Spartanburg employs over 9,000 people—in a town with a total population of just under 38,000. Should BMW’s exports from the US drop in half total production will fall by over one third which probably means between 2,500 and 3,000 employees could be laid off. Even if the number of layoffs isn’t quite that high, I kinda doubt Spartanburg will be voting for Trump in 2020. However numbing for the town of Spartanburg, 2,500+ lost jobs there will be just a drop in the bucket compared to the tens if not hundreds of thousands of jobs Trump’s tariffs will destroy nationwide. But why worry? Trump says he’s got it covered, that he’ll “make steel great again” as his tariffs create more jobs and increases US steel production. The point being that the most likely number of new jobs is a maximum of 28,400. Currently, American steel mills are producing at 74.5% of capacity, and employ 83,000 people. Tariffs on imports should mean that every steel plant in the US will soon be running at 100% of capacity—and total steel output will go up 34.2%. If employment goes up at the same 34.2% rate, it will rise to 111,400. An additional 28,400 jobs. Probably less: you don’t need to increase back office staff to hike throughput on the factory floor. But that number is a maximum for the simple reason that any further increase in steel output requires new plants. And you’re only going to invest a few hundred million dollars in a new steel plant in the US if you’re convinced those tariffs are going to stay in place long enough for you to make a nice profit. But as Trump will only be president till 2025 (or 2021 if he isn’t re-elected), that’s not enough time to get your money back. Compare that to what happened back in 2002 when then-President George H. W. Bush imposed similar tariffs on imported steel: in the brief period till those tariffs were lifted in December 2003, some 200,000 people lost their jobs according to Trade Partnership Worldwide. More than the total number of employees in the entire US steel industry—then and now. If history repeats itself (as it usually does) 200,000 lost jobs compared to 28,400 new ones doesn’t sound like a good deal to me. The steel industry is already gearing up to pocket the tariff bonanza—which will pour over $1.7 billion a year into their coffers. Which works out at around $62,000 for every new steel industry job. Somebody has to pay that price: you, the consumer. 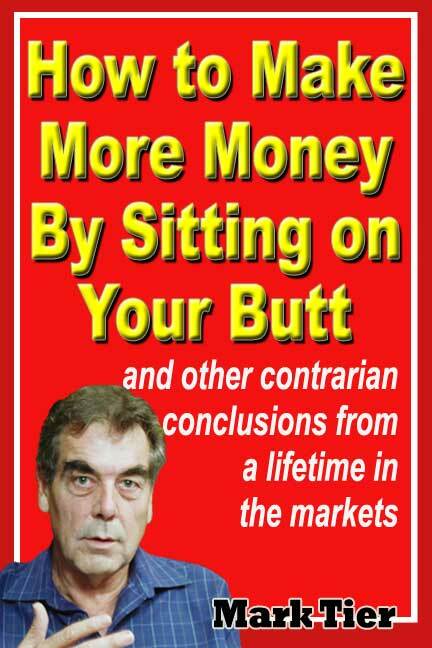 And you, the wage earner. Higher prices at the supermarket, on the car lot, the appliance store—even at Walmart! The effects of Trump’s tariffs won’t be as obvious as Australia’s banana shortage (except in Spartanburg). But the overall results of protectionism are always the same: higher prices at the cash register with up to 200,000 fewer wage earners to buy all that extra made-in-the-USA steel. How You Can Enter Money HeavenIt’s “A Dog’s Life”? Not if You’re a Dog! Good article, but … are those Aussie dollars or US dollars (I’ll assume your target audience is US)? Of course, if you DID convert, you’d have to use exchange rates in effect in 2011 (which you might even remember). PS My last two BMWs (I live in the US) were made in South Africa. Aussie dollars. But in early 2011 US$1 was about 98 Aussie cents, so near enough the same.